Also serving communities of Hellertown. There are 36 Assisted Living Facilities in the Bethlehem area, with 8 in Bethlehem and 28 nearby. The average cost of assisted living in Bethlehem is $3,772 per month. This is higher than the national median of $3,346. Cheaper nearby regions include Allentown with an average starting cost of $3,220. To help you with your search, browse the 189 reviews below for assisted living facilities in Bethlehem. On average, consumers rate assisted living in Bethlehem 4.2 out of 5 stars. Better rated regions include Macungie with an average rating of 4.6 out of 5 stars. Caring.com has helped thousands of families find high-quality senior care. To speak with one of our Family Advisors about assisted living options and costs in Bethlehem, call (855) 863-8283. Located in Pennsylvania’s Lehigh Valley, the city of Bethlehem is the state’s third largest metropolitan region and home to a senior demographic that’s about 17 percent of its overall population. Bethlehem is filled with historic and cultural attractions that seniors may enjoy visiting like the State Theatre for the Arts and the Trexler Nature Reserve. Seniors interested in residing at an assisted living facility have eight in Bethlehem and a further 37 located nearby to chose from. The Pennsylvania Department of Human Services licenses and regulates ALFs in Bethleham, as well as all other PA cities, to make sure seniors are safe and receiving assistance with daily living tasks and activities. Bethlehem’s cost of living index of 100 is exactly on par with the national and state average, so seniors living on a fixed income may find it to be an affordable city to call home. However, even though health care costs match the national median, they are slightly higher than the state's average. Bethlehem’s Old York Road Senior Center features arts and crafts classes, health and fitness sessions, and community outings for area seniors. The city of Bethlehem is home to world-class medical facilities, including St. Luke’s University Hospital, in the event of medical emergencies or illness. Pennsylvania is one of a handful of states that does not tax social security, 401k accounts or work retirement accounts. This leaves more money in seniors' budgets. Seniors who rely on public transportation can use the Lehigh and Northampton Transportation bus service. It offers free rides to seniors age 65 and over. Summers in Bethlehem tend to be comfortable with July highs of 82 degrees Fahrenheit. Winters, on the other hand, may prove more difficult for seniors when it comes to traversing the city as the average January low is 17 degrees Fahrenheit and the city often experiences icy and snowy conditions. Assisted Living costs in Bethlehem start around $3,772 per month on average, while the nationwide average cost of assisted living is $4,000 per month, according to the latest figures from Genworth’s Cost of Care Survey. It’s important to note that assisted living rates in Bethlehem and the surrounding suburbs can vary widely based on factors such as location, the level of care needed, apartment size and the types of amenities offered at each community. 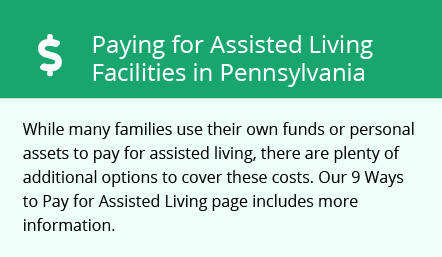 Unfortunately, Medicaid in Pennsylvania doesn't cover assisted living costs. However, seniors who receive SSI may qualify for the state to pay a supplement for their care at an assisted living facility. Bethlehem and the surrounding area are home to numerous government agencies and non-profit organizations offering help for seniors searching for or currently residing in an assisted living community. These organizations can also provide assistance in a number of other eldercare services such as geriatric care management, elder law advice, estate planning, finding home care and health and wellness programs. To see a list of free assisted living resources in Bethlehem, please visit our Assisted Living in Pennsylvania page. Bethlehem-area assisted living communities must adhere to the comprehensive set of state laws and regulations that all assisted living communities in Pennsylvania are required to follow. Visit our Assisted Living in Pennsylvania page for more information about these laws.